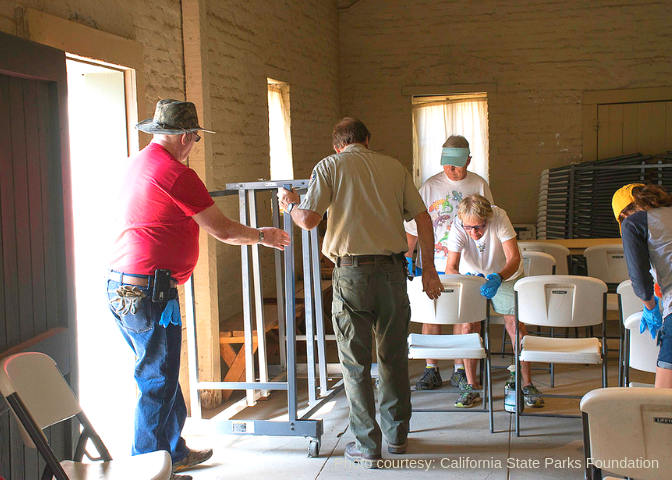 A dozen volunteers helped us kick off the new Park Champions program at Sutter’s Fort State Historic Park (SHP) last month by helping us clean all of the tables and chairs that are regularly used by visiting students, parents, and teachers. It was hard work, but these volunteers knocked it out of the park and made all of our tables and chairs look better than they have in years! A BIG thank you to our new Park Champions!!! We hope you will join us this fall for more Park Champion workdays that will focus on raking leaves on the grounds of Sutter’s Fort SHP. Our beautiful trees drop A LOT of leaves, and these workdays will provide much needed assistance to the State Parks hard-working maintenance team. These workdays are open to anyone age 8 and up who would like to donate time and energy to Sutter’s Fort SHP and are appropriate for families, service groups, or individuals. No training or previous experience is necessary.